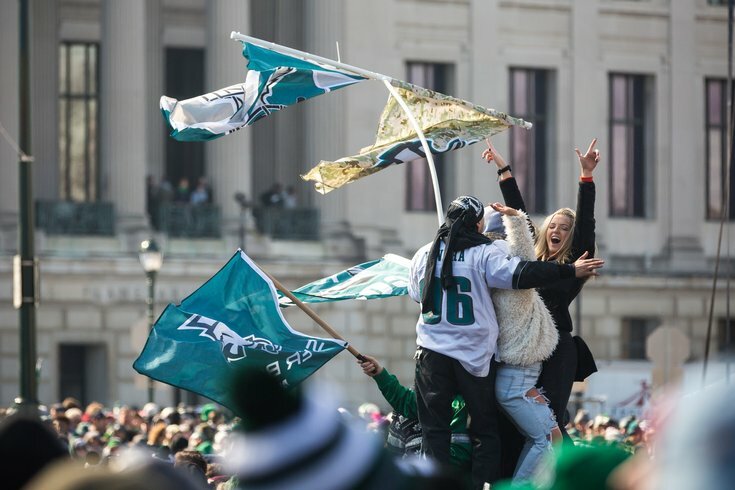 Fans dance on top of an electrical box on the Benjamin Franklin Parkway during the Eagles championship parade, Thursday, Feb. 8, 2018. Philadelphia Eagles fans have waited their entire lives to see the Lombardi Trophy carried down Broad Street, so it's only fitting that their first Super Bowl parade was one they'll remember for the rest of their lives. Obviously, there was Jason Kelce's award-winning, beer-chugging, NSFW performance, which started as soon as the parade pulled out of the parking lot and wrapped up with one of the best speeches we've ever heard. Oh, and he did the whole thing while wearing a Mummers costume. If you watched the parade on TV, you might not have noticed; however, if you were in attendance or following along on social media, you're well aware that the entire parade had a bit of a NSFW theme. That's not to say it wasn't a family atmosphere – it was for the most part – but some parents are definitely going need to have an awkward conversation with their kids this weekend, like trying to explain what "Glory Foles" means.